So tricky to get right. I ordered a pair from Citizens of Humanity and they just didn't work. The material was too heavy. They weren't comfortable and I felt too self-conscious in them. Then I went to the TRF section of Zara and found the perfect pair. I think the hefty amount of stretch in the fabric helps make them feel right. They are just so soft and easy to wear. They feel light on so even in baking temperatures they are cool. I sometimes struggle to work out what to wear on top though. A bright colour is always good but today I went for the easiest (read: laziest) of colour schemes and paired them with a white H&M top. That blend of white on white felt clean. For kicks I added a navy blazer. For the record this was worn indoors and for the 3 minutes it took to take these pictures. This is such a no-brainer outfit but I think I liked the simplicity of it. Despite the heat I have taken to wearing a pretty full face of makeup the last couple of days. This is totally down to a Chanel makeover I had on Thursday that reignited a love for Mat Lumiere (combined with the amazing product that is Les Beiges powder). The makeup artist told me that if I want my face to look good in this climate I need to "start matte". In ten minutes outside you will get the radiance you are looking for when you skin starts to "glisten". It's such obvious advice but he was so right. Thanks Line! These are House of Harlow - Chelsea. I love them! You look incredible in white, Laura! Goes nicely with your skin tone. Great outfit, so simple and chic. White can be such a hard colour to wear, but looks so crisp. I can't wait to slim down and fit back into my Topshop white jeans. I love them, your hair looks beautiful. Thank you :) I had a little trim yesterday and it feels so much better. Must promise myself not to go so long between cuts! Another gorgeous outfit from you Laura, I'd love to have your wardrobe! love the look :), paired well too and so good make up tip. i'l try for sure since it's hot here too. May we invite you to our Firmoo Giveaway? 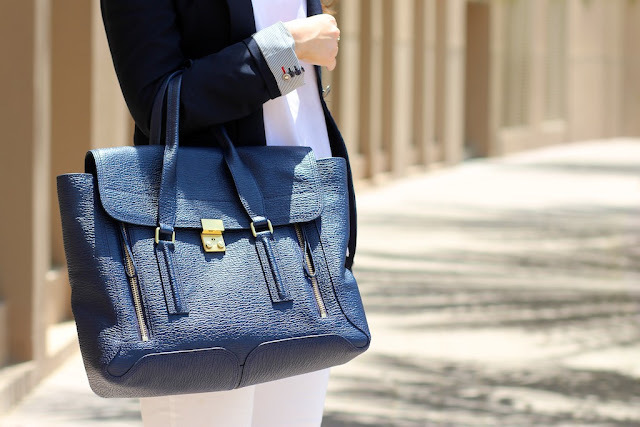 I need a Pashli in my life! The good thing about the Pashli is that it wears so well. The other bags that I have get scratched up so quickly but this has stayed sturdy and in great condition. I would definitely recommend! TRF ones are awesome! I seem to have almost collected every colour hehe been living in them :-) not got white yet tho as not sure will look so good on me lol. I love this look, it's one of my regulars, my cheapo white H & M jeans are fab, so stretchy and comfy. I agree, I often find white jeans lack enough stretch. Its very hard to find the perfect pair. Love the look ! I always want to wear white jeans, but considering I ruined a pair of peach pants I had in minutes (to make it worse, I sat in something clear on the chair but it left a dark mark on my pants, I'd have to seriously invest in tide to go pens before I could wear them out of the house with any amount of confidence. I do love this look though. Love the look of white jeans! That Chanel powder is amazing, I love it! I would love to see what you got during the makeover! Love the pants! Still trying to find the right ones, white-wise. Wondering if maybe a fitted boyfriend style could be what I need. I sympathize with your search! Another flawless outfit Laura. I admire people who an so effortlessly look put together. Gorgeous! So so so pretty! You pulled this off so perfectly! What a great outfit! I've been looking for a navy blazer and I'll have to check this one out. I went through a massive hunt looking for white jeans! At the end, I picked out some Blank NYC ones. They are a great price and they feel really nice. I wore them on my latest post. I really loved your outfit and how complete the look with your shoes and I wanted to see the details, then I click on link. Upps! It's not there :( the link you add for Christian Louboutin Sweet Charity Paisley Python Shoulder Bag. I'll be so happy if you fix the link. The navy & white look fantastic together! Absolutely love this outfit! Wish I was a bit braver so I could wear white without the fear of getting it ridiculously dirty. Your shoes are so gorgeous as well. This look is beautiful - so so stunning! I wish I could pull that off! I really want some white trousers however keeping them clean is another matter! Love this. Simple and Chic! Loved this look on you. It's so classic and polished. Good for you for finding a pair of white pants that flatter you, I'm still on the hunt for the perfect pair. simple and elegant, absolutely LOVE it! You styled that so elegantly! I definitely agree...white pants are so hard to find the perfect pair of. It's always tough to find some with thick enough material, but stretchy enough. 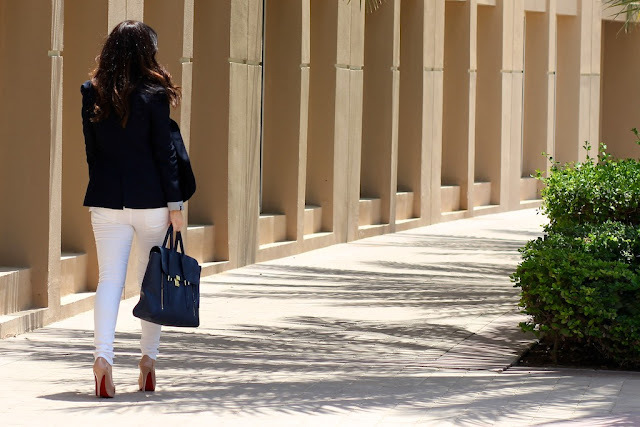 I love the idea of keeping it simple and classic with a white top and a blazer. So glad Elle Fowler recommended your blog....so happy I'm following you on Bloglovin now! That bag looks gorgeous. I absolutely love it. I love the uncluttered look that you created with this gorgeous ensemble, "less is more" is chic!